Music soothes the savage breast, but newcomers to the sonic scene may screech louder than a dubstep-tinged turntable session when they see the cost of professional audio-editing software. Fortunately for folks who don't want to take out a second mortgage to fund their podcast, there's Audacity, a powerful open-source audio editor that offers excellent basic production capabilities for a very reasonable price: free. Audacity isn't as complicated as its full-priced DAW (digital audio workstation) brethren, but the program's dizzying array of buttons and options will stymie most novice users. This handy-dandy beginner's guide walks you through the basics of getting started with Audacity. You know a program is complex when a beginner's guide has a section dedicated to getting files running. In Audacity's case, the traditional File > Open command works as you'd expect it to, but you may run into compatibility issues when you try to open a common file type such as AAC, M4A, or WMA. That's because Audacity doesn't include rights for some proprietary file formats. Out of the box, it supports playback of only six formats: AIFF, FLAC, MP3, OGG, WAV, and Audacity's own AU. While you're mucking around on the LAME library website anyway, take time to download and run the latest version of the actual LAME file as well (LAME_v3.99_3 at the time of publication.) It lets you export (read: create) audio in the MP3 format, which Audacity can't do by default. Audacity doesn't include the ability to rip audio from CDs, either, so you'll have to rip the CD to your computer using a third-party program--Windows Media Player includes CD ripping functionality, for example--and then edit the digital files. Be sure to rip the CD to a supported file format. When you load a track, its waveform graph appears in the middle of the screen--and Audacity activates (left to right) the Pause, Play, Stop, Skip to End, Skip to Start, and Record buttons on the upper-left side of the window. Pressing Play will start the track from its beginning by default. Clicking a specific time on the graph and then pressing Play will start playback from that part of the track, instead. In the Audacity Transcription toolbar, the slider to the right of the secondary green Play button controls playback speed. Moving the slider to the left slows the audio down, while moving it to the right speeds the audio up to Alvin and the Chipmunks velocity. Clicking and dragging the cursor between two points on the graph will cause Audacity to play only the selected section. Get comfortable with this, because highlighting particular sections of tracks plays a large role in editing and adding effects to audio files. Before you start tinkering with the nuts and bolts of an audio track, you'll have to make sure it's stopped and not playing. Not paused; completely stopped. The Edit menu (and the Editing toolbar) contains base-level options like cutting, copying and pasting. Click Trim to remove everything except the selected section of the track. Choose Silence to replace the selected portion with--you guessed it--silence. Use Split to remove the selected portion, replace it with silence, and drop the selected portion into a new track of its own, which appears below the first track. Select Duplicate to copy (rather than remove) a highlighted section of audio and then drop it (as with Split) into a new track of its own. The Effects menu is chock-full of options that augment or enhance the existing audio. You'll have to play with them all to get a feel for the vast array of tools available, some of which have names that don't describe their functions terribly well. Options such as Bass Boost, Echo, and Fade In are straightforward enough, but they have granular effects settings attached to them; Bass Boost, for example, lets you set specific frequency and decibel levels. Be sure to back up your audio files before hacking them to bits in Audacity. If you're performing complex edits in a project, the Label tool comes in handy, especially if your tinkering extends over multiple sessions. To add a Label--which is basically the Audacity equivalent of a note in the margin--to a specific point in the file, click that point in the waveform graph and then select Tracks > Add Label at Selection. The label will appear beneath the graph, and you can type whatever description you want in it. People frequently use Audacity to record podcasts or jam sessions, or to convert music from old cassette tapes and vinyl records into digital files. Recording audio from outside sources--such as a microphone, a guitar, a record player or a USB turntable--is fairly easy with Audacity, though fine-tuning the input sound may take some work. Begin by plugging your input device into your computer (unless you're recording with a computer's internal microphone, of course). 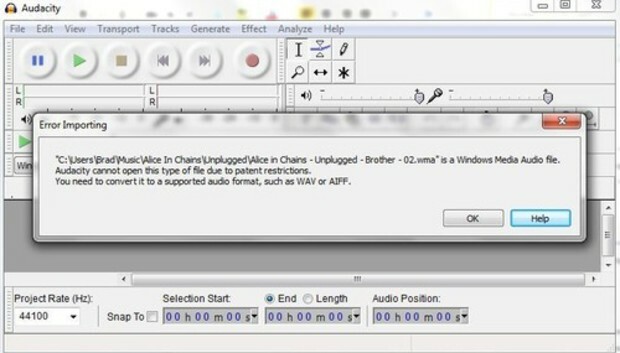 Audacity recognizes all kinds of inputs, including USB audio, standard mic-in, and the beefier line-in. That last tidbit is the secret sauce to recording old analog music sources, by the way; just connect your cassette or record player to your computer with a line-out cable. Next, you'll want to fiddle with the options in the options in the Device toolbar, which holds several buttons that turn into drop-down menus when clicked. If you're on a Windows PC, leave the Audio Host option as MME unless you have a very specific reason to change it. The Output Device button affects how you hear the audio playback. From the Input Device options, you'll select the input you're using, whether it be a USB turntable, a gaming headset, or a discrete microphone. If you connect your device when Audacity is already up and running, you may have to restart the program to make that device option appear. Internal microphones show up as Integrated Microphone Array'. Finally, the Input Channels option lets you choose between stereo or mono recording. Before you start recording, click the microphone icon in the Audacity Meter toolbar--next to the bar that shows the sound output levels when you're playing back a track--and make sound with your input device to confirm that the audio input is recording properly. If it is, the L/R bars above the microphone icon should start flickering in response to the sound. The Input Volume and Output Volume sliders in the Audacity Mixer toolbar let you fine-tune the volume of the sound that's coming in and going out, respectively. When everything's good to go, click the big red Record button to get the action started! The Stop and Pause buttons do exactly what you'd expect. If you accidentally click Stop when you meant to click Pause, hold down the Shift key and click Record again to continue recording at the end of the existing track. Don't let all that hard work go to waste. Select File > Save Project to save the project in a file format that only Audacity to read. This approach is handy if you're editing a complex project across several sessions or if you want to keep, say, your Label Data. Click File > Export to save your project in a format that other programs can read. Choose a location on your hard drive, give the track a name, and save it in whatever audio file type you want. You'll need to install the LAME library plugin if you want to save your track as an MP3. Once you've mastered this process, you have everything you need to start recording, editing, and producing your own music, podcasts, and audio projects. Of course, the information in this article is but a drop in the ocean of Audacity's functionality. We didn't even consider mixing multitrack projects, the Solo button, sound-activated recording, or stereo panning options, for instance. If you find yourself straining to advance beyond the basic tips in this beginner's guide, the Audacity team maintains top-notch manual, wiki, and forum resources that should shed light on deeper functions and features.